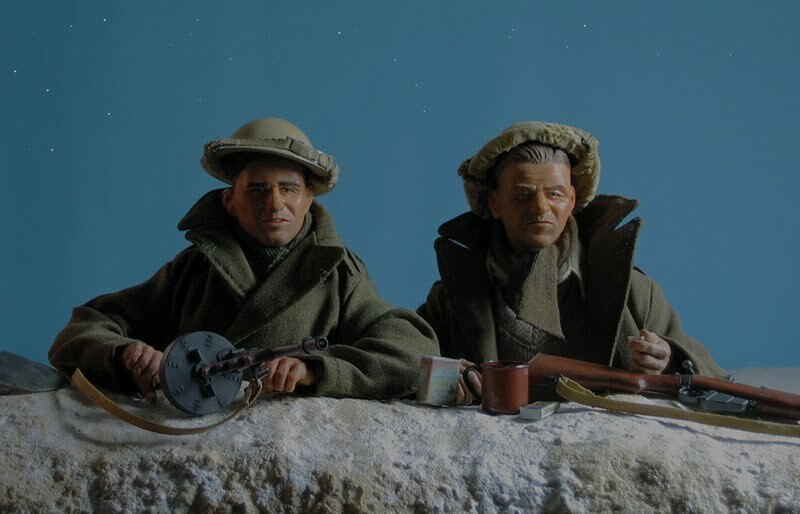 NOSHER AND JIM : The Western Desert , 1942 . These “Tommies up the Blue “ are a pair of archetypes : since Insignia were little worn on Aertex shirts, they could be from any of the regiments of Infantry that fought in the desert, in daytime fighting order. 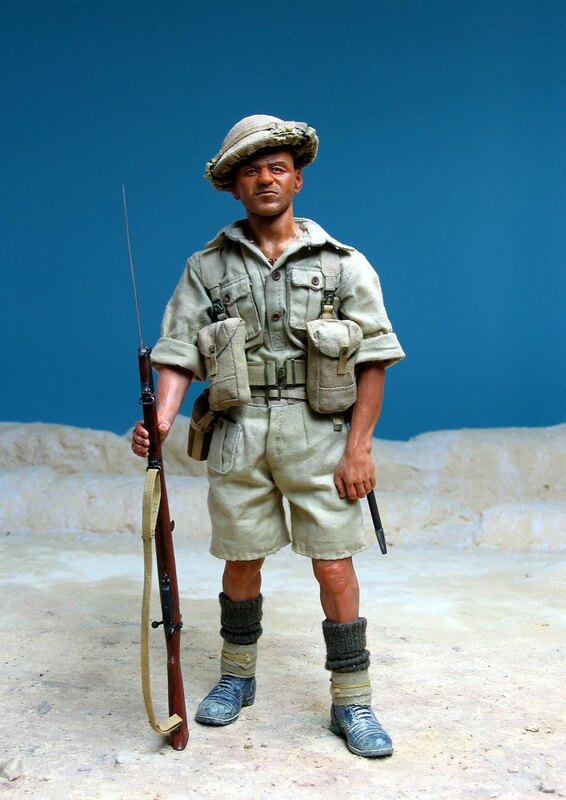 The uniforms are entirely typical : Helmet with sandbag cover , Khaki Drill shirt and shorts, boots , socks and short puttees , 1937 webbing scrubbed and bleached by the sun. As with all my figures, I have rebuilt the webbing equipment to correct scale using etched brass items from my friend Richie Elbourne. See the Catalogue section on webbing tape. 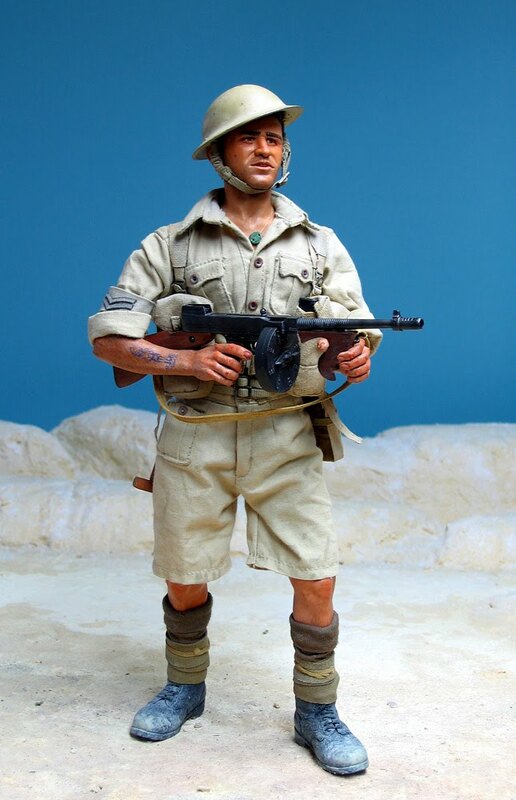 Jim , as a Corporal , carries an early model Thompson with a drum magazine : these were purchased in some numbers in 1940, since the British arms industry had no suitable sub-machine gun available at the time, until the Sten was manufactured . Both these figures have had their limbs modelled in Fimo , retaining the articulation above the elbow and at the ankle and hip. This somewhat restricts the poses possible, but produces a much better effect than visible joints . When bedding down at night , when it could be very cold , the large packs containing the blankets and greatcoats were fetched from the company lorries: these men were all Motorised Infantry , since survival in the desert entirely depended on mechanical transport.